Sparkle Wash of Central Virginia knows how to clean and protect your concrete, paver, and aggregate driveways. 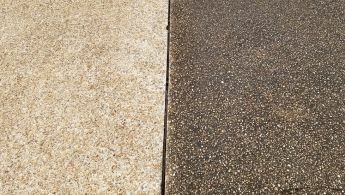 Each type of driveway is different and requires different techniques to clean and protect. Concrete is very durable surface, but does get dirty and will break down over time. 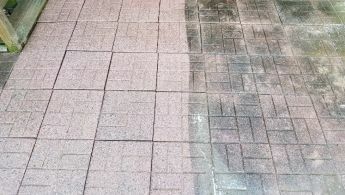 Cleaning your concrete driveway can make a dramatic difference to the curb appeal of your property. We can make a green, black, and dirty driveway look like new again. We never use too much pressure, which could pit or mark the concrete. We use specialized cleaners that make cleaning it with lower pressure possible. We can even do minor concrete driveway repair, such as filling smaller cracks. After the driveway is cleaned, we can apply a professional grade matte sealer to help protect it from moisture intrusion for years to come. 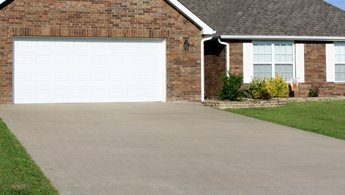 Also, sealing your concrete driveway will inhibit most stains from penetrating deep into the concrete, thus making it easier to clean in the future. Paver driveways need a little extra attention to make them look new again. Cleaning, even with low pressure, will dislodge a lot of the sand between most paver style driveways. Usually, the sand has been eroded by time, or become filled with significant organic growth, anyway. Therefore after a thorough cleaning, Sparkle Wash will resand the driveway. We don’t use just any sand, but a polymeric sand that will harden and help prevent erosion and organic growth. We can even seal the pavers with a clear matte sealer to help protect their beauty for years to come. Much like concrete driveways, these driveways are quite durable. However, they’re a little more susceptible to the damaging effects of moisture and wear, in the form of pebble loss. As the pebbles are lost, so is some of the beauty of the driveway. To prevent pebble loss, cleaning and sealing are required on a somewhat regular basis. Cleaning and sealing your driveway will not only make it look new, but keep it looking new for years to come. Sparkle Wash uses both matte and glossy high quality sealers. We can also fill minor cracks with a sand based epoxy that will help prevent further damage caused by excessive moisture intrusion. Spring 2019: Save 50% Off a Deck Cleaning with a House or Roof Wash. Serving Metro Richmond and these surrounding counties: Henrico, Chesterfield, Hanover, Goochland, and Powhatan.